An unnamed source has reportedly leaked all sorts of details about the rumored remake of the original Halo title. As the new overseers of the Halo franchise, 343 Industries may have recently said that there weren't any side-stories or spinoffs currently in development, but that doesn't rule out remakes. A new rumor reconfirms talk that 343 is allegedly sprucing up a remake of Halo: Combat Evolved, and puts it down for a release in the holiday season of 2011. An unconfirmed source once again tells Joystiq that a higher resolution remake of Combat Evolved is in the works, supporting 1080p. The remake is said to be in development at Saber Interactive, known for Timeshift. The source says the remake is undergoing a visual overhaul with entirely new art assets, but that it probably doesn't use the Halo: Reach engine. In addition, it'll support 3D for those that own a 3DTV, and will feature online co-op. As players might be used to totally different controller configurations by now, the remake will also allow players to reconfigure their controls to modern standards. 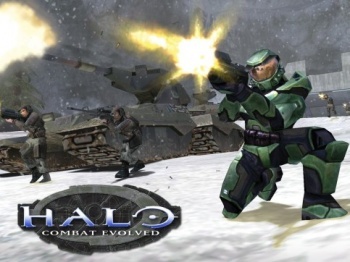 If real, the Combat Evolved remake will probably launch on November 15, 2011. All of this information is 100% unconfirmed, but 343 Industries did say that "cool new content" is coming to Halo fans in 2011. November 15 just happens to be the 10th anniversary of the launch of Combat Evolved, so an upgrade for Xbox 360 owners would make a lot of sense this year.